The 62nd BFI London Film Festival is the biggest event of its kind in London. The Festival will screen over 240 films during the time from the 10-21 of October 2018. The majority of cinemas take part of it and shows you a range of different movies. It’s worthwhile to buy a ticket in advance because some screenings are nearly sold out. But no need to worry too much as there are still a lot of movies with some tickets left! If the screenings aren’t sold out you should be able to buy tickets at the venue 45 minutes before the film starts. The prices vary so on weekdays you pay between £10 and £14, but in the evening the prices start from £13 to £16. If you wish to go to a premiere the prices will cost between £16 and £30. This spectacular restaurant festival takes place in the best restaurants across the city until the end of October. You can try new restaurants with great festival menus for great prices. You can expect to pay between £10 and £60 for each dish. It’s also a good chance to try once a sensational Michelin-starred menu. 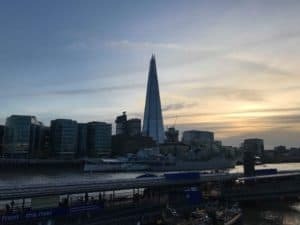 There are also great deals for restaurants in the Shard or in the Gherkin where you can enjoy the breath-taking view while you having dinner or lunch. Don’t forget you have to pre-book a table including the menu offers, just to make sure you’ll have an available table for the special price. Most of the restaurants are still popular without the offers, so they are mostly almost fully booked. If you can’t decide which restaurant you want to try you can also do a restaurant-hopping tour for £45. The ultimate beer street party placed this weekend in Camden and it’s hosted from the Camden town brewery. Enjoy a lot of delicious fresh beer with live music in the background! The entry is free, but they expect a long queue so try to getting there early. The event is on Saturday from 12-9pm and on Sunday from 12-6pm. Once the event is full, you’ll have to wait until people before you can go in. Another option is to buy a ticket in advance for £10. With the ticket, you get 3 pints of beer and guaranteed entry before 5 pm. The party takes place in the Camden town brewery, so the closest station is Kentish Town West and the closest tube station is Chalk Farm. This is also a short 10 minutes walk away from our Chalk Farm residence. We are London Homestays, an independent provider of student accommodation and English language tuition in London, UK. In 2015, we received the British Council’s Accreditation as an accommodation agency. Contact us if you’re a student, trainee or intern and we will help you find a homestay or residence in London!